The Baker Hughes rig count was up 11 rigs this week to 1,979. Oil rigs were up five to 1,318, gas rigs were up six to 658 and miscellaneous rigs held at three. By type, horizontal rigs were up six to 1,180, vertical rigs were up three to 566 and directional rigs were up two to 233. Reuters reported yesterday that some owners of natural gas storage facilities are starting to turn away gas from interruptible customers to save room for customers with firm storage contracts. While this is not an uncommon practice and it doesn't impact a large number of customers, it usually won't occur until much later in the summer injection season. This likely is a sign of great ugliness later in the year as gas production remains high and committed storage is full. This might be the nightmare scenario for the gas industry if gas prices crater and many wells have to be shut-in as pipelines effectively become storage venues of last resort. The EIA working gas in storage report showed a 57 Bcf increase this week, bringing the total gas in storage to 2.437 Tcf. This shouldn't come as a surprise to anyone who enjoyed late April temperatures in mid-March last week. The weekly injection was 50 Bcf greater than last year (+7 Bcf) and 65 Bcf greater than the five year average (+65 Bcf). The current storage level is 50.3% above last year (1.621 Tcf) and 58.6% above the five year average (1.545 Tcf). Last year, storage got as low as 1.579 Tcf, while this year it only got down to 2.369 Tcf, a difference of 790 Bcf. By comparison, in 2008 spring storage bottomed out at 1.248 Tcf. Temperatures in the U.S. last week were 14.1 degrees warmer than normal and 8.9 degrees warmer than last year. On the temperature comparison map below, the 16+ degree bands (indicating a differential of 16 to 30 degrees above normal) look like a giant crater covering the upper Midwest spreading across the Mid-South and Northeast. Given those temperatures, I'm actually surprised the storage injection wasn't higher! The Wall Street Journal had an article today about the double benefit shale gas is bringing to steel manufacturers in the Northeast. Companies like US Steel are seeing lots of new business for tubular steel pipes for the new wells in the Marcellus Shale, and plants that are switching from coal to natural gas are seeing significant cost savings. New revenue and reduced operating costs: got to love it! US Steel is one of many companies seeing the benefits of shale gas. Low and stable gas prices are luring back manufacturing and chemical industries to the U.S., especially to areas like Louisiana, Texas and Pennsylvania with ready access to large supplies of natural gas. While natural gas prices aren't likely to stay this low going forward (after 2014), they will remain much lower than in other countries and likely will be considerably more stable and predictable than in the past. Much is made of shale gas as a game changer for the U.S.'s energy picture, but I think the more immediate and visible impact will be in jobs and economic development from companies involved in the supply chain as well as from industries that have left the U.S. because of high energy costs. Don't be surprised if an "onshoring" industrial trend is one of the legacies of shale gas. Matador Resources completed its initial public offering earlier this year and is starting to make the rounds to investor conferences. Since it was privately held, many people don't know much about the company's operations, so here's a little primer on the company with a focus on its activities around the Haynesville Shale. Matador is based in Dallas and all of its operating acreage is in Texas or immediately adjacent. The company's main focus is the Eagle Ford Shale area, where it has 52,053 gross acres (28,906 net), and East Texas/North Louisiana, where it has 29,128 gross acres (25,477 net). As one would expect in this low natural gas price environment, Matador is focusing most of its resources (86% of its capital expenditures) on the liquidy Eagle Ford right now. It's old news by now, but in its analyst day presentation two weeks ago, Anadarko reported that it is "super excited" about the potential for liquids in its Haynesville and Cotton Valley acreage in Panola Co., TX. The company is seeing 35% liquids in its wells (29% NG liquids, 7% oil) and sees the potential for 1.1 million BOE estimated ultimate recoveries from these wells. Management called this a "300 million barrel opportunity" and says, "we are attacking it." Anadarko's rig count in the region began to spike in fall 2011. The company is running five rigs in Panola Co. and plans to increase that number to six to eight. The company says that the liquid component is unique to its acreage. 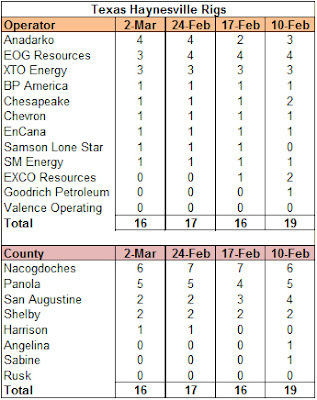 In reviewing the company's recent Panola Co. filings, I only saw a handful of wells with liquids production, and much of it was pretty low (i.e. 6 to 60 Bbl/day). 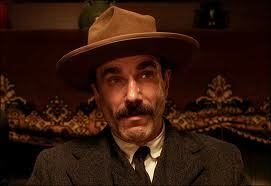 Since the rig count climbed only recently, we should be on the lookout for some liquidy wells in the coming months. 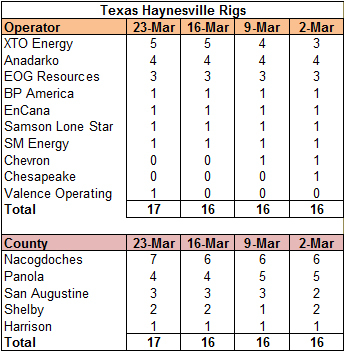 The weekly Haynesville Shale rig count was up one rig to 55. Texas was up one to 17, while Louisiana held at 38. The Baker Hughes U.S. rig count dropped by 16 this week to 1,968. Oil rigs were down four to 1,313, gas rigs were down 11 to 652 and miscellaneous rigs were down one to three. 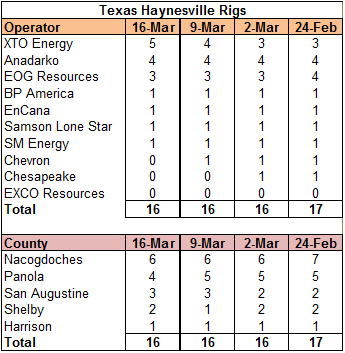 By type, horizontal rigs were down six to 1,174, vertical rigs were down 13 to 563 and directional rigs were up three to 231. 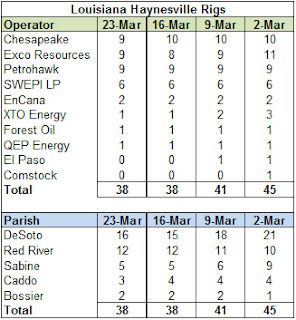 I added a couple more data points (WKP Properties 12 H #1 and Bill Shaw 1H #2-ALT) to the Mid-Bossier Shale spreadsheet and map based on a reader comment and some additional snooping, so there are now three new Mid-Bossier completions on the list. I updated the Mid-Bossier spreadsheet and map to reflect a new completion EOG's Red River 6 #1 that I speculate is a Mid-Bossier completion. 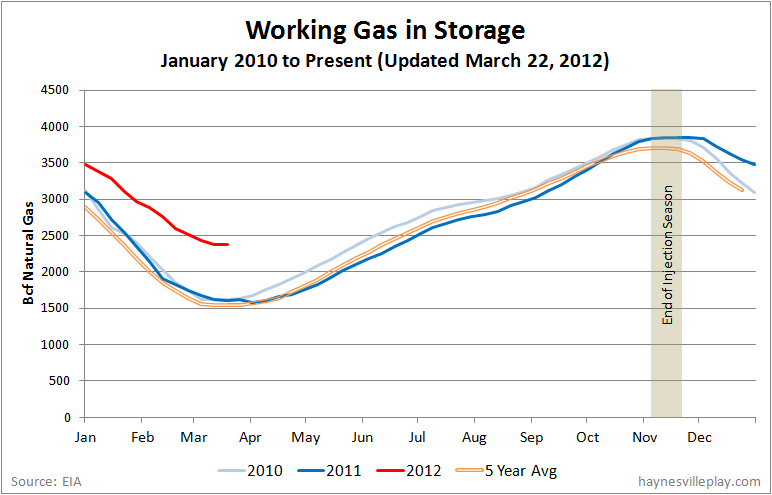 Adding insult to injury, the weekly working gas in storage figure was UP 11 Bcf to 2.38 Tcf. The net change was 31 Bcf higher than last year (a withdrawal of 20 Bcf) and 28 Bcf higher than the five year average (a withdrawal of 17 Bcf). The current storage level is 47.5% above last year (1.634 Tcf) and 54% above the five year average (1.562 Tcf). When I was a kid, my mother used to sweetly sing this one line tune, "you're going the wrong waaaaay" to my sister and me when we were doing the wrong thing. It's all I can hear in my head as I look at the storage report. The difference versus history in terms of raw numbers in the weekly change isn't terrible, but psychologically, it's hard to see the red line on the chart below start to tick upwards. For the past four years, the storage injection season ended somewhere between the second week of March and the first week of April, so this is neither unusual nor unexpected, but it still stings. Temperatures last week were 8.9 degrees warmer than normal and 6.6 degrees warmer than last year. The first public compressed natural gas filling station in Shreveport opened yesterday at a Time-It Lube station. The facility was funded jointly by Time-It and Chesapeake Energy, and it joins two other CNG stations across the Red River in Bossier City. It took a while but it is nice to see public CNG infrastructure blossoming, albeit slowly, in the heart of natural gas country. This slow progress is likely what we will continue to see in current years. While gas fans would like to see things move a lot faster, we should be heartened by the tale of the tortoise and the hare. Have the Fire Sales Begun? On Friday, Atlas Energy announced that its subsidiary Atlas Resources Partners, LP had acquired approximately 12,000 net acres representing 277 Bcfe in the Barnett Shale from Carrizo Oil and Gas for $190 million, which equated to a purchase price of $0.69/Mcfe of proved reserves. The sale was only a portion of Carrizo's holdings in the Barnett, but is the price tag indicative of things to come? In the past, I've made light of "yard sales," especially by Petrohawk, which offloaded valuable but unsexy assets like legacy producing acreage and midstream assets to raise cash before selling out to BHP Billiton. When does the yard sale become a fire sale? I guess when you are raising money to stay in business, not just fund your drilling plan. I don't mean to cast aspersions on Carrizo, but, as Atlas points out in its press release, 69 cents per Mcf is 60% cheaper than other recent Barnett deals (although there may be an apples/oranges issue). Carrizo is a going concern and remains active in other plays, but I doubt management was eager to offload this acreage. While a cheap price, this probably counts as a yard sale rather than a fire sale, but are fire sales coming? 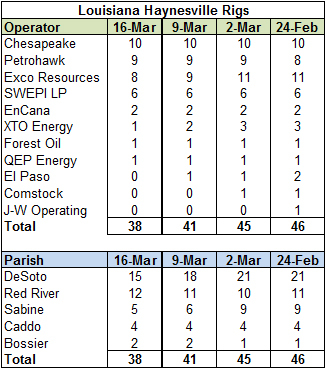 The Haynesville Shale rig count was down three to 54 this week. 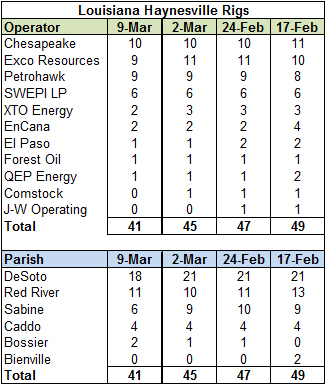 El Paso now has no rigs in the play, but Petrohawk is up to ten, all in Louisiana. The Baker Hughes U.S. rig count showed an 11 rig increase, bringing the total number of rigs working last week to 1,984. 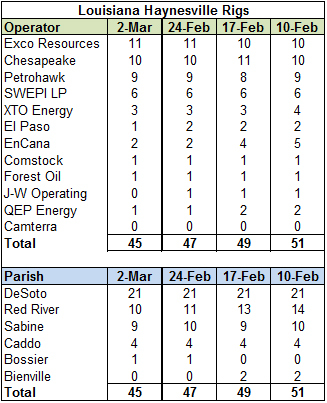 Oil rigs were up 21 to 1,317, gas rigs were down seven to 663 and miscellaneous rigs were down three to four. 663 gas rigs is just below the recent low achieved in July 2009. 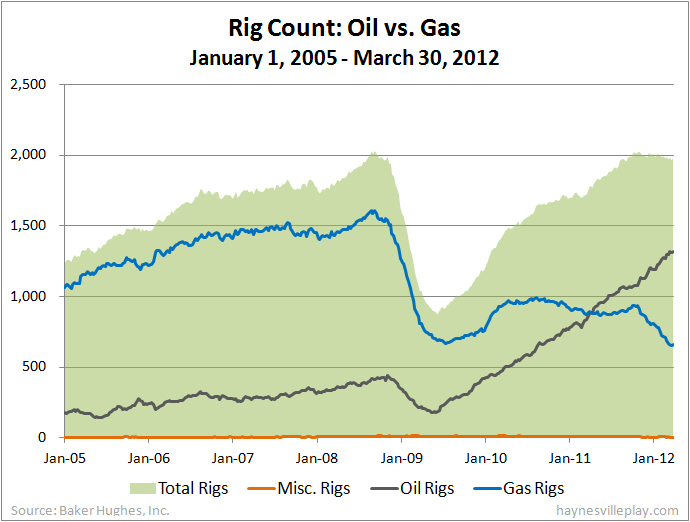 By type, horizontal rigs were up 16 to 1,180, directional rigs were up 16 to 228 and vertical rigs were down 21 to 576. Expect some significant changes in the upcoming Haynesville rig count as the combined north Louisiana/east Texas rig count dropped by eight. At the World Truck Show in Indianapolis this week, an Engineering News-Record writer test drives a new Chrysler Ram 2500 Heavy Duty CNG pickup. The truck starts on gasoline but switches to CNG after the engine warms up a bit. This is the first U.S. made factory-direct (not converted) pickup and has a little less horsepower as well as lower payload and towing capacities than its all-gas brother. Since this is the first of its kind for Chrysler, the Ram model has a ways to go, but for those who value the cost savings and cleaner burning fuel, the future is here today. The weekly EIA working gas in storage report showed a 64 Bcf withdrawal, bringing the total gas in storage to 2.369 Tcf. The weekly withdrawal was just slightly above last year (-60 Bcf) but 19% below the five year average (-79 Bcf). The current storage level is 45% above last year (1.694 Tcf) and 51.7% above the five year average (1.562 Tcf). Temperatures last week were 3.1 degrees warmer than last year and 3.7 degrees warmer than the 30 year average. Just One More Boom? Please? DeSoto Parish made the Wall Street Journal today with an article about the decline in tax revenues seen by the parish now that drilling in the Haynesville Shale has declined substantially from highs two years ago. The article offers the cautionary tale of the boom and bust nature of oil and gas drilling and points out some of the spending projects in DeSoto over the past several years, including recreational facilities and bonuses for some civic workers. I am old enough to remember the bumper stickers in Louisiana during the 1980's that said (paraphrasing), "God, just give us one more boom, I won't piss it away this time." It is almost impossible to avoid pain when dealing with a boom-bust industry because you have to expand to serve the quickly growing market, but when it contracts, so do you. I guess the hardest part of a boom is calling the bust in time to get out of the way. Shale gas continues to cause waves in the energy market beyond our immediate shores. As everyone knows, the price of natural gas has been plummeting from already low levels in recent months because of oversupply from shale and anemic demand. Thermal coal, the kind used to make electricity, is feeling the heat as well. As low gas prices cause utilities to burn more gas, coal is less in demand. The US DOE reports that coal's share of electricity production in December 2011 fell below 40% for the first time since 1978. So what are producers facing oversupply and weak prices to do? Export, of course! All of this should sound familiar to gas fans. Now coal prices are dropping internationally as unexpected U.S. exports are causing oversupply in the seaborne coal market. It's funny how coal and natural gas are singing the same song. I'm waiting for the Sierra Club to raise a ruckus about coal exports the way they are gearing up to fight LNG exports. But what's interesting about the Sierra Club's battle against natural gas (still halfhearted at this point) is that the organization wants to push alternative energy in the next breath. I'm all for new forms of renewable and low pollution-emitting energy, and I believe in the "portfolio approach" to energy security, but alternative energy can't succeed in the marketplace with low natural gas prices. 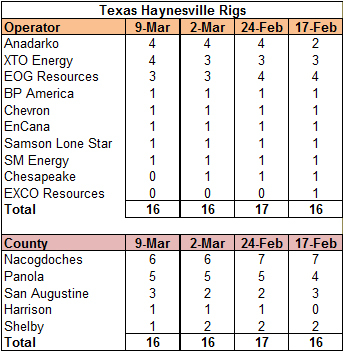 Last week's Haynesville Shale rig count dropped by four to 57. Louisiana dropped four to 41, while Texas held at 16. The weekly Baker Hughes rig count was down 16 rigs to 1,973. Oil rigs were up three to 1,296, gas rigs were down 21 to 670 and miscellaneous rigs were up two to seven. The current level of gas rigs is only five above the recent low of 665 set in July 2009. By type, horizontal rigs were down six to 1,164, vertical rigs were down seven to 597 and directional rigs were down three to 212. QEP to Pull Last Rig? In comments at CERA Week in Houston, QEP Resources CEO Charles Stanley indicated that the company will further reduce spending in the Haynesville Shale and expects to cease drilling operations altogether soon because of low natural gas prices. 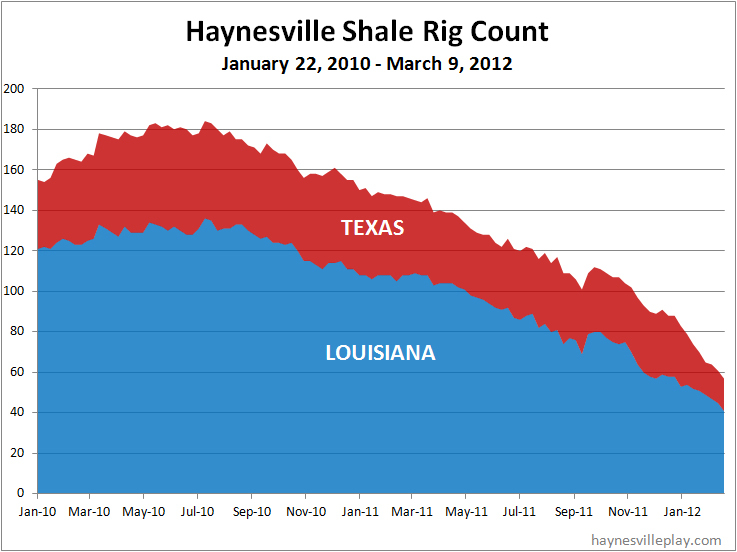 He labeled the Haynesville Shale as the "biggest culprit" to the oversupply of gas in North America. In January 2012, QEP had three Haynesville rigs and was at six as recently as November 2011. The company's Haynesville rig count peaked at eight as late as October 2008. 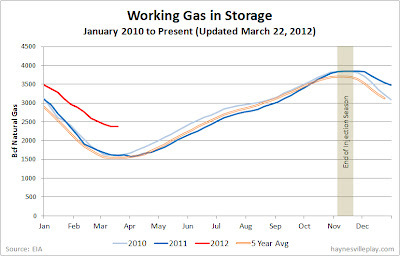 The weekly working gas in storage report showed an 80 Bcf decrease, bringing the level of gas in storage to 2.433 Tcf. The weekly withdrawal was 27% greater than last year (-63 Bcf) but 13% lower than the five year average (-92 Bcf). The current storage level is 43.6% above last year (1.694 Tcf) and 48.3% above the five year average. That's really astounding - for the past few years, the parlour game has been wondering if storage will make it as low as 1.5 Tcf before the shoulder season starts. At this point, just getting to 2 Tcf would be a bloody miracle. Temperatures last week were 3.0 degrees warmer than last year and 2.7 degrees warmer than the 30 year average. But temperature alone doesn't explain the high storage levels, which balance consumption, production and imports. Consumption continues to be low, but the biggest reason storage won't sink is production. While last week's production dropped 0.7% from the previous week, it was still 7.5% higher than the same week last year. I guarantee you that consumption is not growing by 7.5%! Chesapeake Energy and KKR announced this morning that they have created a joint venture to invest in royalties and overriding interests in "key oil and gas basins in the United States." The partnership will be staked with $250 million: Chesapeake will provide 10% of the cash but getting a promoted interest to boost its ownership in the entity. This is an interesting deal for a number of reasons. For Chesapeake, buying up royalty interests is a natural extension of the company's land deal making machine. The company is based around a land acquisition strategy, which comes from the top, as CEO Aubrey McClendon started off in the energy business as a landman. Given the company's cash crunch and the lack of a big catch on the horizon (at least publicly) and the need to be more fiscally conservative, the land team needs to be kept busy. Both General Motors and Chrysler will introduce compressed natural gas pickup trucks in the U.S. in coming years. The GM versions will be bi-fuel, having the option to switch between gasoline and CNG. 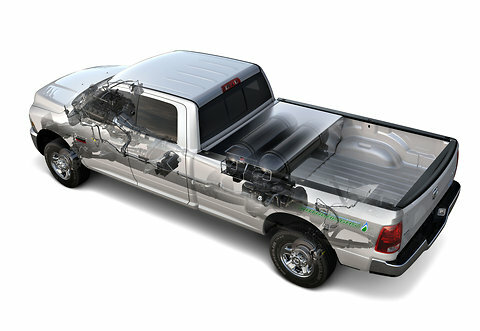 Chrysler, which already makes CNG trucks for the European market, will have a true CNG model and a bi-fuel model. Last week, Rolling Stone published a scathing article ostensibly about hydraulic fracturing that was really just a cheap hack job on Chesapeake Energy and CEO Aubrey McClendon. I've been holding off linking to this article because it is a poor excuse for journalism. As Nick Grealy (nohotair.com) tweeted about the Rolling Stone article: "still on drugs after all these years." This weekend, Chesapeake published a rebuttal that bears reading alongside the Rolling Stone article. Say what you will about McClendon and Chesapeake, but they don't back down from a fight. It likely won't change anything, but you can't let piss-poor journalism go unchallenged. 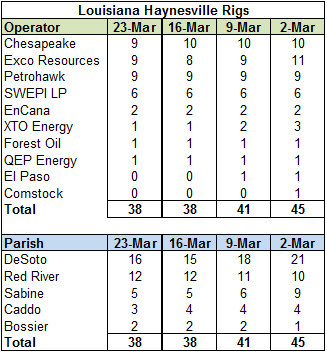 The weekly Haynesville Shale rig count was down three to 61. Louisiana (45) lost two and Texas (16) lost one. The Baker Hughes rig count was up eight to 1,989 this week. 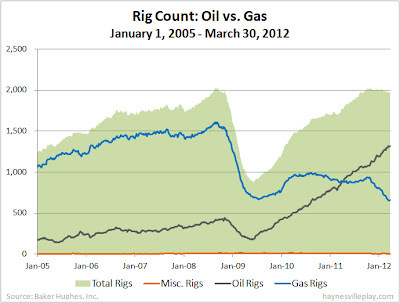 Oil rigs were up 28 to 1,293, gas rigs were down 19 to 691 and miscellaneous rigs were down one to five. The current level of gas rigs is still 26 above the recent low achieved in July 2009, but at the current pace it should beat that low in a few weeks. By type, horizontal rigs were up five to 1,170, vertical rigs were down two to 604 and directional rigs were up eight to 215. The weekly EIA working gas in storage report was another disappointment this week (albeit not as bad as previous weeks), dropping 82 Bcf to 2.513 Tcf. The withdrawal was in line with last year (-85 Bcf) - but that's not saying much - and 31% below the five year average (-118 Bcf). The current storage level is 43% above last year (1.757 Tcf) and 45% above the five year average (1.733 Tcf). Temperatures last week were relatively warm, 4.4 degrees above the 30 year average and 1.1 degrees above last year, which roughly correlates with the weekly withdrawal comparison above.